Weekend Gourmet Blog Carnival, February 20, 2012 - Hartke Is Online! Keep America Safe for Brown Bags! The latest outrage caused by the USDA dietary guidelines was the case last week of a pre-schooler whose school lunch was deemed unacceptable by government food police. Mom’s and Dad’s need to get active to defend their liberty to feed their children non-government approved food! We do this weekly blog carnival, Weekend Gourmet, to promote home cooking and family meals. But, it has a bigger purpose. We want to raise the nutritional awareness of the general public. Bloggers want to teach others how locally sourced, nutrient dense ingredients can improve mental and physical health of your family members. Let’s not settle for mediocre school lunches (frozen and reheated chicken nuggets, yuck!). 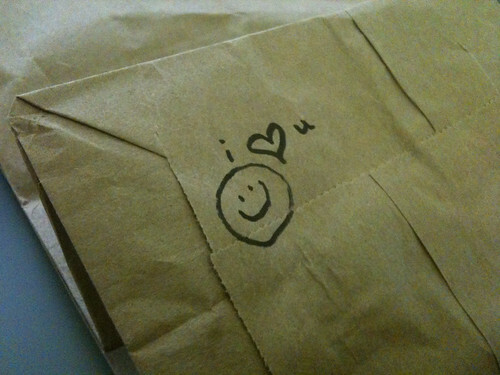 Now, even bag lunches are not safe! A message like this will put the school on notice. Your rights to nourish your child will not be infringed. Back off Food Police! Ok, now is the time for all good bloggers to share their best recipes! Readers, please share your recipes in the comments. Links from your archives or other blogs are ok! Bloggers, please comment and tell your reaction to the seizure of a pre-school child’s home made lunch. And, don’t forget to link back to this post from your blog! The lunch thing makes me mad! My girls take a lunch and even with the restrictions they have (it is a true brown bag lunch due to schedule and issues), I am confident that the lunches they take are far superior to anything the school serves! My husband works at a school, the reports he brings home on the lunches is nothing short of sad. He won’t eat their lunches either! Go to the root of the power that is driving this insane assault on food freedom. It’s not the government per se– it’s the big Ag corporate control that has taken over the government in a bloodless, almost invisible coup. The regulatory agencies are now merely agents of Monsanto, Cargill, ADM, et. al. It makes me mad that someone thinks they can decide what my child should eat for lunch. My packed lunches most often include a hot container of vegetable and organic grass fed beef, and 5 additional items such as serving of homemade fermented or cultured food (such as goat yogurt or sauerkraut), organic fruits and vegetables (an apple, a pear, an avacodo, a cucumber, carrots, tomato, spinach, etc). I guarantee what I send is much better than what the school has to offer. Your post is right on. The key to keeping kids with special dietary needs is good old fashioned home cooking. It’s downright scary that the government is trying to take away our right to decide what our children eat and provide them with safe food! This week I shared part 3 of my series: Empowering Kids on Special Diets. Packed lunches figure prominently! I also shared this week’s Almond Crusted Salmon. It turned out amazing! Is there a news article somewhere about this incident? My kids were at a daycare/preschool that had the same requirement. In fact, my son was an infant when they implemented that rule (he’ll be 3 next week). When the school told the parents, it came across as “no food from home” with the exception of special dietary requirements (gluten-free). What the director said to me was that they would be required to offer school lunch (along side the lunch from home) if home lunch didn’t meet the minimum requirements of 1 meat, 1 dairy, 1 fruit, 1 vegetable, 1 grain. I’m pretty sure it’s because the school receives a grant from the gov’t that helps pay for the school “food”. Sometimes that term can be used loosely; other times you’re still left rolling your eyes… breaded chicken nuggets, milk, mandarin oranges, potatoes and pasta… that lunch fulfills the requirements. Wow! I missed the news about the school lunch! Do you have a link to an article? We’re in a catholic school. I’m not sure how much government policy can affect us. Definitely something I need to check out! This is absolutely disgusting. The government has no business telling anybody what to eat. And to have government agents deciding that a child’s home made lunch is not good enough because it does not fit arbitrary “one size fits all” government standards is tyranny, plain and simple. They want to indoctrinate your children at every level. Eating the factory food gets them used to the food that you have access to within the industrial military complex, prisons, the military etc…IT is all about control and pretending like that is not the underlining reason is complete disregard for the truth..Yeah, go ahead and call me a conspiracy theorist, but there is no doubt and any educated person knows the truth, it isn’t about your ‘good health’. ~Ron Paul in 2012. I’m speechless basically. Schools intervening in parent’s decisions about what to feed their kids is so outrageous! Today I’m sharing my post on Paula Deen that poses the question: Is Paula’s cooking representative of traditional southern cooking? It is not over. The little girls lunches are still being inspected, and the school is giving her an unwanted carton of factory milk every day since the first inspection. What if she actually starts drinking that stuff, which is being given to her every school day? It has also been confirmed that it was a FEDERAL AGENT who was at the school for the purpose of inspecting lunches on the day in question, and gave the school a less than passing grade because too many home lunches did not meet Federal requirements. Yes, the Federal government is sending agents into pre schools to inspect the bag lunches of children. How sick is that? My source is a CNN video interview with Sara Burrows, the reporter who broke the story last week. She has interviewed the parent, the grandmother, and the school principal. This is the perfect blog for anyone who wants to know about this topic. You know so much its almost hard to argue with you (not that I really would want…HaHa).